This is a valuable resource for organizations interested in starting a community orchard. It provides information on how to plan the orchard, select fruits and organize volunteers. It also provides sources of plants, sample budgets, funding opportunities, sample contracts and bylaws, and sources of technical advise. Community orchards are growing all across America today. These orchards are being established by local organizations looking to beautify their land and grow healthful food for their people. A community orchard is owned, leased or held in agreement by a community group or local authority. Community orchards can provide a place for gardening, relaxation, pleasure and healing. • Some orchards focus on fruit production, while others serve as outdoor classrooms for education. • Some orchards are developed for youth programs, while others are developed into a living museum honoring a community’s history. • Some orchards serve as the center of a community festival, while others serve as an alcove of peace and tranquility. • Some orchards are fenced to keep wildlife out, while others try to attract wildlife. The success of a community orchard will depend on the commitment and resources of the local people who manage it. Community orchards usually are open and accessible to the community at all times. As well as enjoying the surroundings, local people can share the harvest or profit from its sales, taking responsibility for work in the orchard (Common Ground, 2011). Community orchards can be valuable assets to communities in North Dakota. Our people need to eat more fruits. Only 30 percent of North Dakotans consume the recommended amount of fruits needed for good health (two servings per day). This deficiency stunts the mental and physical growth of our children. This deficiency makes us more susceptible to infectious diseases (such as colds and flu) and chronic diseases (such as diabetes and cancer). This deficiency contributes to obesity and related health concerns (Centers for Disease Control and Prevention, 2012). North Dakota is one of the leading agricultural states in America, yet it ranks 48th in fruit production (U.S. Department of Agriculture, 2014). An increase in locally grown fruit will increase our access to fruits and encourage greater fruit consumption in our daily diets. Community orchards can be used to grow fruits for profit. A 2008 survey of North Dakota’s farmers markets showed a great need for more farmers and fruits at the markets. Many of our communities have open parcels of land with access to water. These plots could be future sites of orchards where communities can host local events, plus grow food for their families. This publication is a guide to help North Dakotans start community orchards. 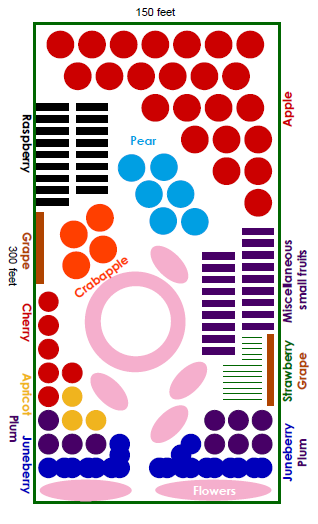 We discuss the basics of establishing the orchard and selecting cultivars. We describe organizational structures and financial considerations. Orchards can provide a setting that brings communities together for celebration and for more healthful living. The first step for success in a community orchard is to select the proper place. No spot in North Dakota is perfect. We all know this is a tough place to live for us and our plants. Use the information below to find the best spot for your community orchard and make adjustments as needed. Fruit trees and shrubs demand full sun (at least eight hours per day) to flourish. Fruit trees and shrubs need good drainage. Plants that sit in water for extended periods will suffer from root rot. Orchards often are planted on slopes not suited for row crops. Avoiding low spots where frost accumulates is critical. A killing frost (28 degrees) in late spring can kill flower buds, which will eliminate your crop for that year. A killing frost early in fall will damage fruit before it is ripe. Avoid the top of a hill because the plants will be fully exposed to strong winds. Plants on top of a hill may be subject to more hail damage and fire blight disease. The exposure of the slope is important, too. A south-facing exposure experiences more temperature fluctuation than a north-facing exposure. Trees in a south-facing orchard are more likely to break their dormancy during a warm spell in late winter; then, when cold weather returns, these buds will be killed. Trees in a south-facing orchard are more likely to suffer sunscalding and cracking of their trunks in winter. North- and west-facing slopes will be more subject to harsh winds. Winds can injure trees and cause ripening fruits to fall before harvest. A shelterbelt would be especially helpful in this situation. As stated earlier, trees on a north-facing slope will be slower to bud out in the spring and thereby be less affected by late-spring frosts. This is beneficial, but trees on a north-facing slope may not get enough heat during the growing season to ripen the crop before the first killing frost in the fall. In this case, early ripening cultivars would be advised. A community orchard should be easily accessible to the community it serves. Figure 1. Considerations when selecting a site for your community orchard. A community orchard is a major investment of time and money. A nearby source of water is required for at least the first two years. Clean, cultivated areas away from brush favored by deer and other wildlife are preferred. Now that we have found the ideal spot, we have to make sure the site is available and stays available. A common problem of community garden projects is their land is taken away from the project after a couple of years, often after the project has made significant improvements to the site. The long-term availability of the land with an orchard is even more critical because the fruit trees may not bear decent crops for a few years. A long-term agreement must be in place with the landowner (see Appendix 4) to ensure the work involved in establishing the community orchard bears fruit (literally) and does not go to waste. The land for a community orchard should be prepared the year before planting, if possible. A soil test is a good idea. This will help you understand what nutrients are lacking and gives you the opportunity to make adjustments before planting. The pH of the soil should be known and adjusted, if needed. Many soils in our state have a slightly alkaline pH (7.1 to 7.5). This is suitable for most popular fruits. A slightly acidic soil pH (6.5 to 6.9) is ideal because it will maximize the availability of nutrients to the plants. A pH above 7.5 will make growing popular fruit crops difficult because some nutrients will be locked in the soil and become unavailable to plants. Phosphorus is important for the establishment of roots and flower buds, but it does not move easily within the soil. This makes phosphorus an especially important nutrient to adjust before planting the orchard. Salty sites are not recommended. No plants like salt because the salt will desiccate roots. A few fruits, such as aronia, cherry plum, Juneberry and seaberry, are more tolerant to salt than others. Applications of compost to the soil can improve the structure and moisture-holding capacity of salty soils. Mulching will prevent evaporation and subsequent accumulation of salt. Also, planting on a slope where salty water does not accumulate can help. If possible, seek a better, less saline location. In an urban area, you need to be cautious of the possible presence of lead from old paint or heavy metals from waste products. Old buildings or piles of debris should be warning signs. A soil test to evaluate the presence of heavy metals would be wise for this public gathering place. Learn your hardiness zone (see Figure 2) and select good-quality plants from a reputable nursery (see Appendix 1). If possible, purchase trees that were grown at a northern nursery. Figure 2. 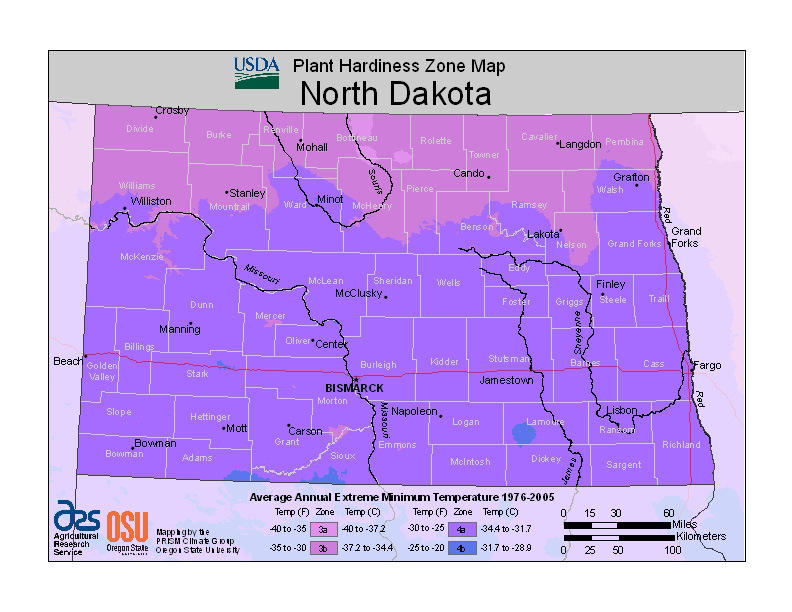 Plant hardiness zone map for North Dakota. Source: U.S. Department of Agriculture. Soil conservation districts can provide inexpensive plants. In some cases, these are seedlings of plant species and not cultivars. For example, a seedling of hardy plum may be available, but not a ‘Waneta’ plum, a cultivar that was selected for superior hardiness, productivity, ease of care, resistance to disease, and/or flavor qualities. If the goal of the community orchard program is to plant some fruit trees and share the fruit with wildlife, soil conservation districts can be an economical source of plants. On the other hand, if you are aiming to have a productive orchard with high-quality fruit, you will be better off in the long run to grow cultivars from commercial fruit nurseries. Bare-root plants are less expensive than containerized plants but are available only in the spring and must be planted soon upon arrival. If the orchard is not prepared, the stock can be planted in a temporary trench in the garden. Bare-root stock is soaked two to four hours in water before planting. Bare-root plants are highly recommended for strawberries, raspberries and other small fruits due to their affordability and ease of planting. Plant your orchard in the spring once the soil becomes dry enough to work. Before digging, consider whether you need to call the Diggers Hotline to avoid damaging underground utility lines. When planting a tree, dig a wide hole that will allow the roots to spread out evenly without cramping or coiling within the hole. Roots can be lightly trimmed, if needed. Tree depth is important. We generally plant trees and shrubs at a depth so the soil surface is about 1 inch above where the uppermost major roots (crown roots) appear on the trunk. Graft unions of trees are located above the crown roots and should be planted above ground. If graft unions are planted below ground, you will reduce the dwarfing effects or other beneficial qualities of the rootstock. Don’t plant too shallowly: Crown roots should not be exposed. Don’t plant too deeply: The tissue above the crown roots is stem tissue and is not meant to be belowground, where it can suffer from stem rot. We have a tendency to plant our trees and shrubs too deeply; maybe we are worried our Dakota winds will blow them away. Do not add compost, manure or other soil amendments in the planting hole. The tree needs to get used to the native soil. If you add lots of amendments in the hole, the tree roots might like the conditions in the hole so much that they never push out into the native soil. This is especially likely to occur in heavy clay soils. In this case, this is comparable to planting a tree in a clay pot; the roots will grow in a coiling pattern and eventually strangle the tree. In heavy soils, roughen the perimeter of the hole to help the tree roots break through the clay. As you fill the planting hole with soil, gently but firmly tamp the soil over the roots. When the hole is about three-fourths full, pour a bucket or two of water into the hole to help the soil settle and to remove large air pockets. Then fill the remainder of the hole and water again. Trees in established pastures sometimes are planted without cultivating the land. Prepare an area at least 3 feet in diameter before planting each tree (wider is better). Mulch after planting. Grass is a very aggressive competitor with trees, absorbing water and nutrients out of the soil. Keep the grass away from the trunk of the tree using cultivation or a grass-killing herbicide such as glyphosate. Do not use mowers or weed whips to control grass near young trees or you will risk damaging their bark and killing the tree. For strawberries and raspberries, add a couple of inches of compost or rotted manure into the row before planting. Mix it thoroughly into the native soil to make a rich, well-drained bed. Just as in the case of trees and shrubs, plant berries so the crown roots are just below the soil surface. If you purchased a tree with branches, do minimal pruning at planting time. Remove any broken branches. If two branches are rubbing against each other, trim out the least desirable branch. Start pruning and training the tree next spring. If you purchased a nonbranched “whip” tree, cut the stem at 30 inches. This will stimulate the first flush of branches at this point. Fertilizer is generally not needed at the time of planting (ideally, we will have corrected any major soil deficiencies before planting). Do not apply standard granular fertilizers in a planting hole because they can burn the roots. Wait to fertilize a newly planted tree or shrub for at least a couple of weeks. Spring is the best time to fertilize. The worst time is in late summer because the fertilizer can create a flush of new growth that may be succulent when winter arrives. A good way to monitor the fertility of the soil is to see how much new growth you get each year. The annual growth of a tree can be seen as the glossy tissue from the tip of the branch to a dark scar that encircles the branch. Young fruit trees should grow about 18 to 24 inches per year and then about 10 to 12 inches when they reach fruit-bearing age. If you are not getting this type of growth, consider a soil test and fertilizer treatment. Watering is absolutely critical at the time of planting. Thoroughly soak the root area. Check on the plants every few days and make sure the soil below the surface never dries completely. Young trees need approximately 5 to 10 gallons of water per week when the weather is dry. The orchard will need to be watered regularly until the plants have recuperated from their transplanting shock. This is at least two years. A weekly watering should be expected. Water deeply. Roots will grow where the water is located. If you water deeply, the roots will grow deeper. Keep the foliage dry when watering to prevent foliar diseases. Watering in the morning is best; watering at night is worst because you encourage a humid environment that favors disease. Mulch is especially important in North Dakota. Organic mulches, such as wood chips and shredded bark, will conserve moisture and reduce moisture stress on the young plants. Organic mulches moderate soil temperatures. Mulches will slow warming of the soil in the spring, thereby delaying flowering and reducing the risk of frost damage to the buds. Mulches will moderate summer heat, keeping the roots comfortably cool. Rock mulches never should be used in an orchard. They trap heat, accelerating bud break in spring (and potential frost damage), as well as creating excessive heat stress in the summer. Mulch will reduce weed problems near the trees. Mulch also can serve as an effective barrier between the trunk and grass. Lawn mowers and weed whips are common killers of trees. The most precious tissue of a woody plant is the tissue just beneath its bark (this is where new growth originates). Keep your mower away from the trunk. Set mulch in a ring pattern at least 3 feet in diameter. Arrange the mulch so it is at a minimal depth near the trunk and then steadily gets deeper, up to 4 inches along the perimeter of the mulch ring. In this way, the mulch will serve as a reservoir and bring applied water toward the trunk. Avoid building mulch up against tree trunks because this could serve as nesting habitat for bark-biting voles or lead to stem rots. Fruiting shrubs also will benefit from mulching. Keep the mulch minimal at the trunk and extend it out at least 18 inches to either side of the shrub. Organic mulches will need to be replaced periodically as they settle and decompose. Staked trees bear earlier and produce higher yields than unstaked trees. Staking will protect trees from damaging winds and keep the root system stabilized in the soil. Grafted trees especially will benefit from staking because it will prevent the scion from snapping off the rootstock. A 10-foot-long, 3/4-inch-diameter electrical conduit pipe works well. Locate the pipe a few inches away from the trunk and pound it 2 feet into the ground at the time of planting. After several years, the pipe will rust at the soil surface. At that time, pound the pipe 2 feet down again. If you don’t like to use a pipe, use 2- to 3-inch rounded wooden posts or 2-inch square pressure-treated lumber. Raspberries (especially the vigorous purple raspberries) and some gooseberries will benefit from trellising. Permanent posts can be spaced 20 to 30 feet apart down the row. Cedar or pressure-treated posts, 4 to 6 inches in diameter and 6 to 8 feet in length, work well. Bury them at least 30 inches in the ground. Wrap heavy-gauge wire from post to post on either side of the posts, 42 to 48 inches above ground. The canes will grow between the wires. More complicated trellis systems are also available. If raspberries are planted in hills, a metal or wooden post can be placed in the middle of each hill. Twine then is used to wrap the canes around the center post. Grapes should be staked at the time of planting. A trellis should be constructed in short order to train the vines. Growers should seek technical advice in selecting the best trellis for their situation, giving consideration to the type of grape grown, management skills and amount of land available. The high-cordon system often is used to train the vigorous grape cultivars that commonly are grown in North Dakota. This system has one wire located 6 feet off the ground, running along the support posts. A second wire at 36 inches high commonly is added to support newly planted vines and retrained vines in the future. Fruit trees are sensitive to the scalding rays of the winter sun. Trees should be wrapped in the fall to protect the trunks. White plastic spiral tree guards are an alternative. These wraps also will protect against rabbit and rodent damage. The trunks of trees should be painted with white paint to reflect the sun’s rays. Use a 1 latex paint:1 water mix. Make sure you paint at least the south- and west-facing sides of each trunk. Wildlife can destroy an orchard planting quickly. In North Dakota, we are most worried about voles, rabbits, deer and birds. A good way to minimize problems with voles and rabbits is to reduce brushy areas near the orchard. Keep the lawn mowed regularly. The trunks of the trees can be protected with a ring of hardware cloth wrapped around them. The cloth should be at least 2 feet tall with a mesh of 1/4 inch. Bury it an inch in the ground. Ideally, we should protect the trees up to at least the first branch. Birds usually are controlled with nylon netting. Cherries and Juneberries are especially at risk. Place the netting before the fruit begins to change color. Scare devices such as one-eye plastic balls and plastic owls may work for a day or two, but the birds soon will learn these devices are harmless. Chemical repellents that repel rabbits and deer temporarily are available. These will work when wildlife pressure is light. If wildlife pressure is aggressive, the only solution is fencing. For deer, an 8-foot-tall fence is recommended. Fencing made with nylon is relatively affordable and will work for several years. Metal fencing will last longer but is more costly. The first few years are most critical to help the orchard get established. Electrical fences are most reliable but usually not appropriate for a public orchard. 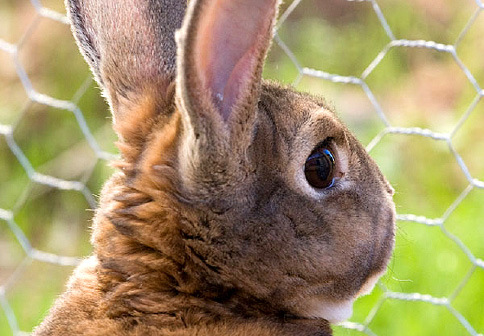 For rabbits, a 3-foot-high fence, buried a few inches in the ground, is recommended. The mesh should be 1/4 inch. Fencing is the only sure way to prevent damage. This can be a touchy issue in a community orchard. Nobody likes to use pesticides, but fruits are susceptible to insect pests and diseases. Have a policy in place before the planting is established. This policy needs to address whether chemical control is allowed in the orchard and whether this control must be exclusively organic. In a public orchard, the minimal use of toxic chemicals is strongly encouraged. Whenever pesticides are sprayed, signs should be posted to alert the public. An integrated approach is needed. Start by keeping the plants in good health. Healthy plants are more likely to tolerate pests. Prune on a regular basis to open the plants to good air circulation and sunlight. Sterilize pruning shears between trees if diseases such as fire blight or black knot are in the orchard. Remove any rotting or fallen fruits in the orchard. Remove weeds, which harbor insect pests. Avoid overhead watering, which creates a humid environment for diseases. Select disease-resistant cultivars, if possible. Monitor your plants closely to detect the first signs of problems and then take action quickly. Insect traps are available. Apple maggot traps, for example, can be hung in apple trees to monitor for the presence of the pest. If the pest is not there, you don’t need to spray. Monitor the weather. 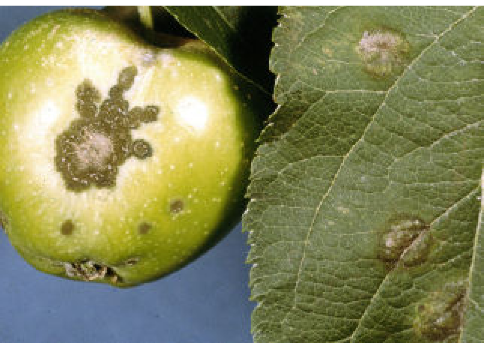 Foliar diseases, such as apple scab, are most likely to occur when the spring season is wet. Relatively safe products are becoming more commonly available. Copper sprays, including copper sulfate (Bordeaux mix), will control most diseases. Neem (azadirachtin), spinosads and pyrethrins are organic products that control many insect pests and are relatively safe. Products containing Bacillus thuringiensis (Bt) can control some types of insects safely and effectively. Some organic apple growers dust their trees with Kaolin clay to reduce feeding damage from insects. Organic products are not necessarily safer than synthetic products. For example, malathion, a popular insecticide in fruit production, is less toxic than organic products such as rotenone or nicotine. Contact your local Extension Service and/or local fruit growers for advice on controlling pests. Traps can be used for monitoring apple maggots, which lay eggs in apples. Apple scab disease can be controlled with regular pruning, fungicide sprays and resistant cultivars. 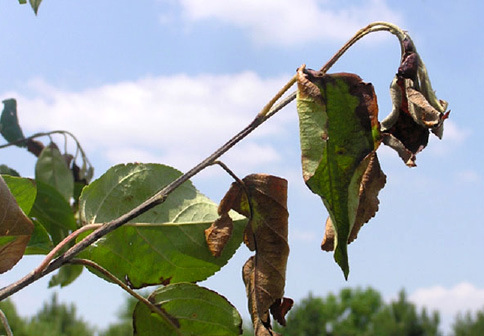 Bacterial diseases such as fire blight can be managed with pruning and resistant cultivars. All fruit trees need to be pruned, and the best time is late winter (March through April). The tree is dormant and the wounds will heal quickly in the spring. Also, the tree is leafless and we can see the branches and their structure easily. Pruning is needed to keep a tree healthy. This will bring more sunlight and air movement into the canopy, thereby reducing disease problems. Pruning will keep a tree stronger. Remove the weak branches that cannot support fruit. This will create a structure that can stand up to the winds and blizzards of North Dakota. Pruning will improve fruit quality. The increased sunlight in the canopy will brighten the fruit. The increased air movement will reduce pest problems, too. Pruning helps us manage the tree. By keeping the tree low, we can spray (if needed) and harvest the fruit more easily. On the other hand, unpruned apple trees produce low-quality fruit. Unpruned trees are more susceptible to diseases and storm damage. Unpruned trees are more likely to be attacked by insect pests; no one likes wormy fruit. The major goal when pruning is to maximize the amount of sunlight and air movement in the canopy. The most popular structure for fruit trees is the modified central leader. This structure has one major branch in the center and the widest part of the tree at the bottom, with the branches working their way up in a “Christmas tree” shape. To maximize the amount of high-quality fruit, the tree should not be taller than 16 feet (10 feet is better). Pruning a fruit tree is not hard, but you have to take your time, constantly stepping back to make sure you see all of the angles. Start by taking out the suckers that develop at the base of the trunk. Figure 3. The basics of pruning fruit trees. Fruit trees, especially apples and pears, have a tendency to develop vertical branches (we call them water sprouts). Water sprouts clutter the tree and do not produce fruit. Remove all the water sprouts. That was the easy part. Now we have to think a bit. If the tree is 5 years old or younger, it still has time to develop the structure we like to see in healthy fruit trees. Be patient; this may take several years. If possible, the first branch should begin about 30 inches from the ground. Ideally this branch will face the west or south to shade the trunk from the scalding rays of the winter sun. In the next 24 inches, we will develop our first series of major “scaffold” branches. Four branches, each facing a different direction (north, south, east and west), would be ideal. Imagine viewing the tree from above. The branches coming out of the trunk should resemble spokes coming out of the hub of a wagon wheel. Then develop a gap of about 24 inches between the sets of scaffold branches to maximize sunlight and wind movement. Next, develop the second set of scaffold branches. As the tree grows, you may allow for another 24-inch gap and then a third and final set of scaffold branches. Allow a foot for the leader and you have a perfect tree. Of course, nothing in nature is that perfect. These are principles only. Maybe you cannot have a gap between the sets of scaffolds; in many cases, you will have more of a steady progression of branches up the tree (keep adjacent branches going in different directions so they do not shade each other). Look for branches with sturdy angles. Sixty degrees is best (some growers call these 10 o’clock and 2 o’clock branches). Branches with narrower crotches are less fruitful and subject to splitting. Vertical branches do not produce fruit. Horizontal branches produce fruit but will droop from the weight of the crop. Also, horizontal branches will not generate the vegetative growth we need. Remember to maximize air movement and sunlight in the canopy. Remove any inward- or downward-facing branches, which create shade pockets. Remove the weaker of branches that cross over one another. They can rub against one another and create wounds. Remove any broken branches. Try not to remove more than 25 percent of the tree’s wood during any single year. If your tree has been neglected for a long time, a lot of wood needs to be removed, and getting it in shape will take a few years. Most fruit growers use a lopping shears and hand pruning shears when pruning. A bypass shears will make cleaner cuts than anvil shears. A pruning saw sometimes is used after the tree is well established to remove large branches. Never use wound dressings when pruning fruit trees. The wounds will heal faster if you leave them alone. After the major branch structure is in place, we can develop the secondary branches. 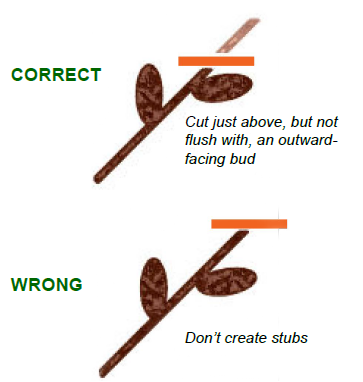 We will make the cuts with our hand pruners, making the cuts just above a bud, allowing for a collar (see Figure 4). This will encourage healing and lead to more outward growth (less cluttering of the canopy). Prune to a bud that faces where you want the branch to grow; usually this is an outward-facing bud. Figure 4. How to prune a small branch. Don’t leave stubs when pruning. These do not heal well and often lead to disease. If you are not sure you are done pruning, keep pruning. Open the tree up. Create lots of windows for air and sun. Open up the tree and you will be rewarded with high-quality fruit. North Dakota has lots of old apple trees. These trees are tall, rarely pruned and never sprayed. The trees provide some flowers in the spring, shade in the summer and a few decent fruits in the fall. It’s nice, but we can do better. If you prune the tree, you could have a healthier tree with more blossoms in the spring and fruits of higher quality in the fall. To get better apples, you need to get more sunlight into the canopy. You also need to bring the tree down to size so you can manage and harvest the fruits more easily. The ideal “Christmas tree” shape described earlier is going to be more difficult to develop in an already mature tree. After all, the leader may have grown 30 feet tall. In most cases, it’s wise to go for an umbrella shape now, with branches cascading in all directions from the main trunk(s). The tree has been neglected for years, and getting the tree into decent shape will take years. This first year, focus on reducing the height of the tree. The ultimate goal is to bring the tree down to about 12 feet tall. The principles of pruning are the same as described earlier. Establish a network of sturdy branches, preferably at 60-degree angles from the trunk. Search for sturdy branches about 3 to 4 inches thick within the old canopy. Look for young, strong branches; these branches have glossy bark while old branches are scaly. 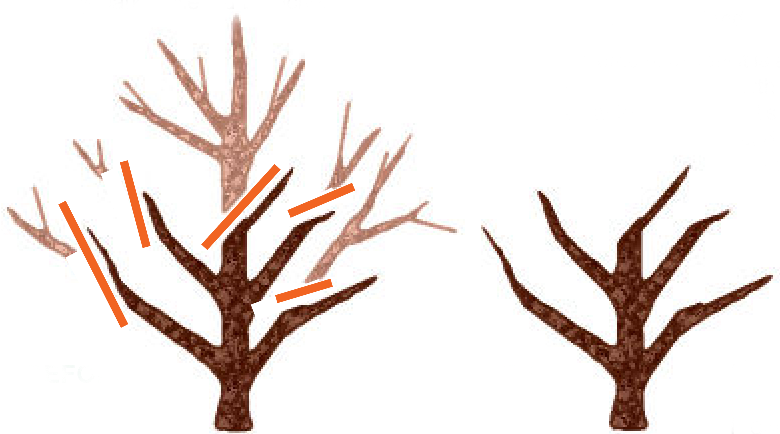 Once you identify a strong, young branch, trim above it to bring the tree down to size (Figure 5). To avoid sunscalding and shocking the tree, try not to remove more than 25 percent of the tree’s wood at any one time. Giving yourself at least two years to reshape the tree is best. Remove the clutter within the tree. Remove suckers, water sprouts, broken branches, and inward- and downward-facing branches. This mature tree has an extensive root system and it will keep pumping a lot of nutrients and water to the branches. Expect lots of new shoots to appear this year. Aggressively trim out the vertical shoots the following spring. Also, take advantage of any new 60-degree branches that emerge and use them as future scaffold branches. After about four years, you will see a big difference in the health of the tree and fruit production. But to be honest, you still have an old tree, and the best days of this tree are long gone. Unless the tree is a special heirloom type or has historical value, the best long-term solution may be the single-cut “chainsaw” method. In this case, we remove the old tree. In the place of the overgrown tree, you could plant two apple trees (or perhaps add a cherry or plum), which will be properly trained. After four years, you will have superior yields of superior fruit, and the best days of your young, vigorous trees will be ahead of them — not behind them. The trees will be an attractive feature in your landscape, not a curious eyesore. Some of us feel cutting down a tree in a prairie state such as North Dakota is a sin, but trees are renewable resources. Cutting down one tree and planting two in its place is OK. We can chip up the old tree to use as mulch for the new tree(s). Plus, we will have more fruits to share with our families. It’s a win-win situation. Figure 5. Pruning an overgrown apple tree. Sources for this chapter include University publications from Cornell and Wisconsin (see Sources on last page). Fruit production is difficult in North Dakota. Bitterly cold winters, strong winds, hailstorms, unexpected frosts, cool summers and irregular rainfall limit the production of fruit crops. Selecting fruits and cultivars adaptable to our state will be critical for success. The first step is to know your hardiness zone (Figure 2). This will be the biggest limiting factor in selecting the right fruits for your orchard. The following are some of the most promising fruits and cultivars for our state. Cultivars are listed in order of ripening. Apple is the favorite fruit grown in the backyards of North Dakota. Look for cultivars that are hardy, mature early, and produce high-quality fruit. The earliest cultivars are generally good for fresh eating but do not store well. Later-ripening varieties store better, but they run the risk of never maturing before the snow flies. Apple growers in Zone 4 should strongly consider a tree with dwarfing rootstocks, especially if snow cover is present during the winter. Trees with dwarfing rootstocks are easier to manage, bear earlier and are more productive. Staking is generally recommended to prevent dwarf trees from breaking at their graft unions. Look for the hardiest rootstock available. Among the hardiest are Ottawa 3 and Bud 9, but these are not as commonly available as others. G30 from Cornell University is hardy and resists fire blight. The introductions from Malling are most common in the marketplace, and M26 is the hardiest of this group. M7 has been widely planted in Midwest orchards for decades; it produces a freestanding tree. These rootstocks will create trees about 12 to 16 feet tall under normal growing conditions. Dwarfing rootstocks are not hardy in Zone 3. These gardeners should grow “standard” trees with rootstocks of ‘Dolgo’ or ‘Antonovka’, and then prune aggressively to keep the trees 16 feet or lower in height. Apples are susceptible to many diseases and insect pests. Prevent diseases by pruning every year to open the tree to more sunlight and better air movement. Pick up fallen apples in fall. Use traps to monitor for insects such as codling moth and apple maggot. Apricots are loved as much for their delicate blossoms in the spring as their golden fruits in the summer. Apricots bloom very early so keep out of frost pockets and plant in a protected site. A north- or east-facing location will delay spring blooms and reduce the risk of frost injury. These cultivars are naturally dwarf and can be planted 10 to 15 feet apart. The Canadian cultivars are self-fruitful but produce better yields when more than one cultivar is planted. They are hardy to Zone 3. The Minnesota cultivars ‘Moongold’ and ‘Sungold’ should be planted together and are hardy to Zone 4. Tart cherries are easy to grow and very hardy. Also called “pie” or “sour” cherries, they are used for pies, sauces, jams and breads. Ripe cherries are delicious to eat right off the tree, too. Late-spring frosts can kill blossoms, so plant them out of frost pockets. Bird netting may be needed to protect fruits as they ripen. Pie cherry cultivars are self-fruitful. They are naturally dwarf and can be planted 10 to 15 feet apart. These tart cherries are hardy to Zone 3, unless noted otherwise. Sweet cherries are not hardy in North Dakota. Cherry plums were developed to survive the extreme weather of the northern Great Plains. They are extremely hardy (Zone 3), resist drought, and will bear fruit after one to two years. They grow as small trees 6 to 8 feet tall and can be spaced 4 to 8 feet apart. They are self-unfruitful. Plant at least two cultivars for fruit set. The fruit is not as big or as delicious as most other plums. Fruits begin to ripen in late August. The tart flavor of crabapple makes it popular for canning and in making jellies. This fruit is grown just like apples. A crabapple will pollinate an apple tree and vice versa. Most crabapples are partially self-fruitful but will produce higher yields in the presence of another apple or crabapple cultivar. These cultivars are hardy to Zone 3. The flavor of a tree-ripened peach, bursting with juices all over your face, is one of the greatest taste experiences you ever could have. Peaches are not reliably hardy in North Dakota. Limit plantings to Zone 4 and in sheltered areas only (and have very low expectations). Keep the tree short and consider shielding it from winter winds by wrapping the branches with cord and burlap. Keep trees out of frost pockets to protect the delicate blossoms in the spring. Peach trees often are grafted on American plums. Space them 12 to 15 feet apart. The bright white blooms of pears in the spring are spectacular, but they are sensitive to frost. Pears are especially sensitive to fire blight disease, which is often introduced into a tree after hail (a common problem in North Dakota). Upright growth habit requires diligence in pruning. 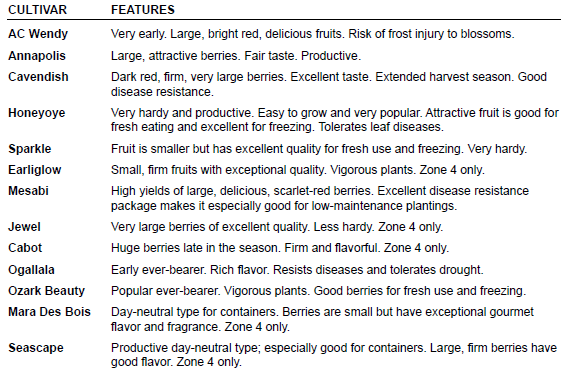 Cultivars below are hardy in Zone 4 unless noted otherwise. Most plums are hardy but bloom very early in the spring, making the blossoms at risk of frost injury. Blue (European or prune) plums are self-fruitful. Only one cultivar is needed and ‘Mount Royal’ is the hardiest. It is hardy only in Zone 4 and may experience dieback. 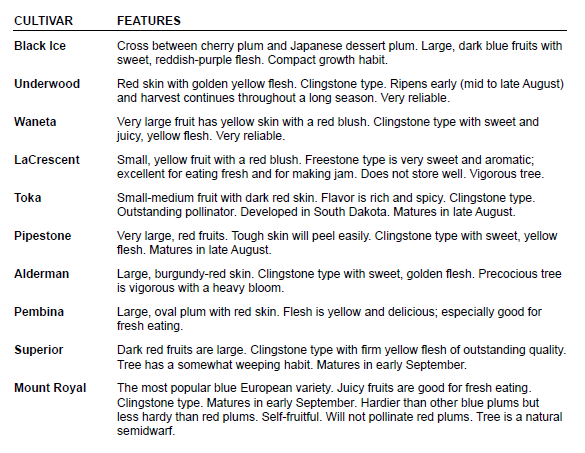 Other cultivars mentioned here are “red” or hybrid plums. These plums are self-unfruitful so plant at least two of these cultivars for good fruit set. ‘Toka’ is often used as a pollinator. 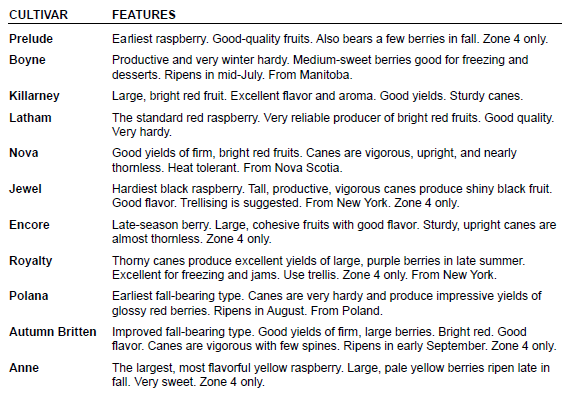 All “red” cultivars described here are hardy in Zone 3. Plums require little pruning and naturally grow 12 to 15 feet tall. Space them 10 to 15 feet apart. Very productive and easy to grow. Also called black chokeberry, the fruits have a sharp, dry flavor and are usually not eaten raw. Europeans prize this American fruit for its nutrition (high in anthocyanins) and use it to make juice, syrups and preserves. Almost pest free, this fruit is popular among organic growers. Aronia is a beautiful ornamental shrub with white blossoms in the spring, showy dark purple berries in the summer, and brilliant red fall foliage. The multi-stemmed shrub grows 4 to 8 feet tall and is hardy to Zone 3. Space 4 to 6 feet apart. Tolerant to salt. Blackberries do not grow well in North Dakota. Traditional blackberry canes bear fruit on their second-year growth. Our winters are bitterly cold, and canes rarely make it to their second year of life. A new series of cultivars are available that bear fruit on their first-year canes. Harvest the fruits in September and mow the canes in April. The crowns will send up new fruit-bearing canes every summer. Hardy to Zone 4; mulch for additional winter protection. These cultivars ripen late and are best suited for tunnel production. Cultivars are self-fruitful. Space plants 2 feet apart and grow in a hedge like fall-bearing raspberries. North Dakota is a terrible place to grow blueberries. Our soils are too alkaline, we do not get adequate snow cover, our winters are too cold, and our climate is too dry. Grow haskaps or Juneberries instead. To grow blueberries, start with a soil test to know your soil pH. If your soil pH is 7.5 or lower, add sulfur to drop the pH down to 4.5 to 5.5. Spread peat moss over the site, building a 4- to 6-inch mound. Mix the peat moss and sulfur into the soil bed. Expect to add sulfur every few years. If soil pH is 7.5 or higher, reducing the pH will be very difficult. You will need to grow blueberries in raised beds or containers using purchased topsoil and peat moss. The following blueberries are hardy to Zone 4 and grow low (18 to 30 inches). Plant two cultivars for fruit set. Currants are one of the world’s most nutritious fruits. Black currants, in particular, have a tremendous following in Europe. Currants have a unique tart flavor and are usually used in wines, breads and jellies. Some cultivars serve as a host to white pine blister rust, but white pines are not common on our wind-swept prairies. Cultivars listed below show resistance to the rust. The multi-stemmed shrub grows 4 to 5 feet tall and is hardy to Zone 3. Space 3 to 4 feet apart in rows 6 to 8 feet apart. Among the most shade-tolerant fruits. Self-fruitful. Prairie cherries from Saskatchewan show great promise. They are extremely hardy (Zone 2), self-fruitful, and can be trained into trees or shrubs (minimal suckering). Fruits are large (nickel-size), dark maroon, and flavorful. Very productive. Shrubs grows 6 to 8 feet tall. Space 5 feet apart. Protect fruit from birds when ripening. Rabbit damage can occur during the winter. Plant 4 inches deeper than previously grown. This American native is hardy (Zone 4) and easy to grow. The creamy white flowers can be used in cordials. The dark purple fruits are processed into wines and jellies. Cultivars have larger and sweeter fruits than wild elderberries but may not ripen in northern or central North Dakota. Plants from local soil conservation districts may be better suited to your local climate. Elderberry prefers a rich, moist soil and grows 6 to 10 feet tall. Space 7 to 8 feet apart in rows 10 to 12 feet apart. Two cultivars are required for good yields. Canes are unproductive after three years; remove in the winter. Late ripening. Native to the north, gooseberries are hardy and fairly productive. The thorniness of the bushes and their susceptibility to powdery mildew and other foliar diseases are concerns. This multi-stemmed shrub grows 3 feet tall. Space 4 feet apart in rows 6 to 8 feet apart. Hardy to Zone 3. Self-fruitful. Remove old canes to maintain vigor and productivity. Grape growing in our state has been limited due to our frigid winters and short growing season. Select cultivars that ripen early and are hardy enough to survive winter without protection. Expect fruit to be tart most years. Cultivars are self-fruitful. Space 8 feet apart in rows 10 to 12 feet apart. Pruning and trellising required for optimal production. Hardy in Zone 4 unless noted otherwise. State growers’ associations in North Dakota and Minnesota have helpful advice. Honeyberries can be called the blueberries of the northern Great Plains. New Canadian cultivars (called haskaps) are larger, sweeter, and fleshier than blueberries or other honeyberries. This nonsuckering shrub grows 4 to 6 feet tall and is hardy to Zone 2. Widely adaptable to soils in North Dakota. Space 4 feet apart in rows 8 to 10 feet apart. Two different cultivars are required for fruit production. Native to North Dakota, Juneberries are hardy and tolerate slightly alkaline soil. The delicious fruits are prized by gardeners and birds alike; use netting to protect the ripening fruits. Blossoms are sensitive to late frosts in the spring; avoid frost pockets and south-facing slopes. Shrubs grow 4 to 18 feet tall and may spread 12 feet across. Plant more than one cultivar for better fruit set. Flower thrips, root aphids and fungal diseases are concerns. Raspberry is a popular fruit that is easy to grow in North Dakota. Plant both summer- and fall-bearing types to extend your harvest. Fall-bearing types bear fruit on their first-year canes. Select early-ripening cultivars only. You can mow the canes in April for a strong fall crop or allow the canes to develop and bear fruit during the summer. Summer-bearing types bear fruit on second-year canes, which are pruned out after harvest. Raspberries are established to grow in hedgerows or hills. If hedgerows, set canes 2 feet apart in rows spaced 6 to 8 feet apart. Prune every winter to thin canes to stand 3 to 4 inches apart. If hills, set hills 4 to 6 feet apart in each direction. Prune in the winter to allow six to eight canes per hill. Purple raspberry canes are pinched when 30 inches tall to encourage lateral branches and these lateral branches are trimmed back to 18 inches long in the winter. Trellising will make plantings easier to manage, especially the more vigorous purple types. The following cultivars are hardy to Zone 3 unless noted otherwise. Although not a fruit, rhubarb is used like fruit in pies, sauces, jams, and breads. It is a perennial crop more suited to a community orchard rather than a community vegetable garden, which is usually tilled every year. Rhubarb is very easy to grow and thrives in the cool temperatures of North Dakota. Prepare a sunny spot with a rich, well-drained soil. Space crowns 3 feet apart. Harvest stalks in the spring. These selections are especially hardy, at least to Zone 3. Bright orange clusters of berries adorn thorny branches with silvery foliage. Used in floral arrangements. The fruits are extremely nutritious and have an intense, citrus flavor. Most often is sweetened and diluted for use in juices. Very hardy (Zone 3) and tolerates salt, alkaline soil, sandy soil, and drought. The shrub grows 6 to 10 feet tall. Space plants 6 to 9 feet apart. Fruit-bearing female plants need a male pollinator (one male for up to eight female) and is pollinated by wind. This plant requires minimal pruning. Can be invasive. June-bearing types are the easiest to grow. Choose an array of cultivars to spread your harvest from mid-June into mid-July. Space plants about 24 inches apart in rows spaced 36 to 42 inches apart. Remove the flowers the first year to help plants focus on establishment instead of using their energy to produce a few berries. The following year and for several years thereafter, you will have buckets of berries with minimal work. Ever-bearing types send out a small summer crop and then one or two more flushes of fruits later. Day-neutral types produce a few berries all summer long. Neither of these types produces many runners, so space them closer, about 12 inches apart. Remove blossoms for the first six to eight weeks. These are less vigorous plants, and new plantings are established every two years. No matter the strawberry type, mulch with a blanket of straw after the ground freezes. Cultivars listed below are hardy to Zone 3 unless noted otherwise. Sources for this chapter include University publications from Minnesota, Montana, and Wisconsin (see Sources on last page); and catalogs of Bailey’s, Jeffries, Jung, One Tree World, Nourse, Raintree, and St. Lawrence Nurseries. The concept of a community orchard in North Dakota began as a series of small, locally based projects, much like our community gardens and farmers markets did. In most cases, these projects started off with a series of meetings to discuss the objectives of their initiatives. As each project evolved, members gained new insights into how their organization could run most effectively. A community orchard organization should be structured to encourage high levels of participation and impact. It should promote trust and transparency among its members and foster growth as an organization. Bylaws are rules enacted by an organization to provide it with a framework for operation and management. These rules may specify the qualifications, rights and liabilities of membership. Powers and duties are specified, as well as grounds for the dissolution of the organization. See Appendix 5 for an example of a community orchard’s bylaws. Bylaws are required when an organization decides to become a nonprofit corporation. This step typically is done when an organization decides to take on major projects (such as a community orchard) and seek outside funding and liability protection. Major projects bring with them some risk and some disagreements among members. A formal structure can help guide the organization through any turbulent times. • Official name of organization and legal address. • Organizing members, names and addresses. • The purpose, goals and philosophy of the organization. • Membership categories and eligibility requirements. • Membership dues, how much and when paid. • Details on when and how often regular or special meetings of the membership are to be held, as well as regular and annual meetings of the board of directors. • Description of what officers are necessary, how they are chosen, length of term, their duties and how vacancies are filled. • List of any special committees, their purpose and how they operate. • A system for bylaws to be rescinded or amended, perhaps by a simple majority. • Any official policies or practices. For example, the group will not use synthetic pesticides; the group will donate fruits to the local food pantry; the group will maintain the orchard and keep it attractive. We live in a litigious society, and one accident can destroy a community orchard. 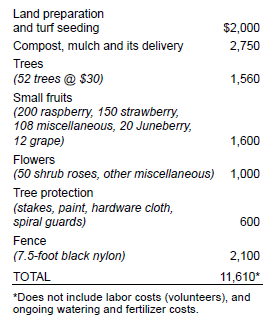 The community orchard organization needs to have an agreement in place with the landowner before the project begins (See Appendix 4 for an example). Many landowners insist on protection from lawsuits stemming from accidents in the orchard. Pruning mishaps, falling off ladders, strained backs from carrying heavy loads, exposure to toxic pesticides and stings from wasps are just a few examples of accidents that can occur in a community orchard. At the very least, a landowner can be protected partially by inserting the “hold harmless” clause mentioned earlier in the bylaws of the organization managing the project. Even better, liability insurance can be purchased. Not all insurance agencies will offer this protection, but many major agencies will. Insurance agencies that work with social service agencies in the region may insure you. You also may call a pick-your-own farm in the area for guidance. Insurance firms that deal with many carriers may help you get the best policy at the best price. In some cases, the landowner may provide liability protection to your group at no charge. This might happen when the community orchard is in a public park, school or other public place. For example, the activities of an orchard in a county park may fall within the jurisdiction of the county government’s existing liability insurance policies. The key is to prevent accidents. The community orchard group can place a warning sign at the entrance of the orchard. If toxic pesticides (organic or synthetic) are applied, people entering the orchard should be notified. Lessons on proper pruning and spraying techniques can be offered. Keep the heights of fruit trees as low as possible to reduce the need for ladders. Another way to reduce liability is to limit the dates and times the orchard is open to the public. • Determine the main goals of the orchard (communal fruit production, renting plots, marketing, beautification, historic preservation, other, or combination thereof). • Determine who the garden will serve (general public, food pantries, youth, other). • Develop a leadership team and arrange for future meetings. • Envision committees needed for the project (planning, fundraising, volunteer recruitment, other). Assign leaders, if ready. • Develop a list of project priorities (site location, fundraising, volunteer recruitment, other). • Develop an orchard identity (name, logo). • Look for a sunny spot with well-drained soil and access to water. The land should be accessible to the public. An old farm or cultivated field is ideal. • Avoid frost pockets and be wary of south-facing slopes. • Understand liability issues related to the property. • Understand the history of the land: any contamination, waste dumping? • Obtain a long-term agreement (10 years or longer is desired). • Define liability issues for the project with the owner. Seek legal assistance if needed. • Consider forming a 501 (c)(3) nonprofit corporation. • Pursue funding opportunities locally and nationally. • Solicit donations from community organizations and businesses, including fruit nurseries. • Establish contacts in the news media. • Get a website to promote the project. • Develop a plan to fund the orchard beyond establishment. • Identify sources of volunteers, including Master Gardeners, garden club members and youth groups. • Identify local experts: fruit growers, NDSU Extension staff, local fruit nursery operators. • Promote the project through the news media. • Give presentations to community service organizations and garden clubs. • Encourage neighbors of the site to get involved. Trade them fruits for their watchful eye. • Select hardy fruits, preferably those resistant to diseases and insect pests. • Understand your limitations of human resources and funding. Starting small and excelling is better (this will generate more community interest) than starting big and struggling (this will lead to frustration and burnout, and will lose community support). • Gauge the level of commitment you have from your project team. Plan accordingly: Fruit trees will require a longer and stronger commitment to grow, compared with berries. • Storage area for tools? • Beautify public entrances with flowers and other ornamentals. • Plants requiring pesticide applications should be placed in less visible, low-traffic areas. • Determine rental plot areas, if any. • Prepare written rules for renters and volunteers. • Make a sign to let people know a community orchard will be established at the site. • Kill existing vegetation, if needed. • Outline beds for small fruits. Add compost or other organic matter to the beds. • Lay out plots for renting, if any. • Contact the news media on planting day to generate publicity. • Plant, stake and mulch trees. Trellis other fruits, if needed. • Start a watering program. • Talk to local schools and youth groups. Youth will serve as positive ambassadors for the project. • Invite neighborhood children to get involved. Give them ownership in the project; this will reduce vandalism. • Consider establishing an area for youth plots. • Encourage activities at the orchard; this will generate public interest and reduce vandalism. • Establish contact people in case of emergency. • Organize work crews and work days. • Monitor for disease and insect pest problems, weeds and wildlife damage. • Use the website to keep everyone informed of the activities and needs of the project. • Arrange for regular meetings of the leadership team at the orchard. • Establish a plan for distributing the harvest. • Contact the news media when the harvest season starts. • Clean up the orchard and protect plants before winter arrives. • Recognize volunteers and key project “friends” (sponsors) for their efforts. • Any new needs for the project to address? • Future strategies for funding? • Any new resources available? New support from sponsors may appear once they see the progress and “legitimacy” of the project. • What worked and what didn’t? • Changes needed in organizational structure or leadership? • Organize an end-of-year meeting and celebration. • Set a date for the next planning meeting. The following list of companies is provided as a convenience to readers. It is not an endorsement by the NDSU Extension Service, nor is it exhaustive. Plants and supplies may be available from other equally suitable companies. A community orchard may be as simple as planting a few trees in a pasture or as elaborate as establishing a public park. The following example is something in between. This one-acre orchard is a pleasant place to visit, a pleasant place to learn, and a pleasant place to grow fruit. You enter the orchard through a doorway with flowers (see pink ovals) and Juneberry (a most ornamental fruit) in front. Plums, cherries and apricots are near the front; these early bloomers will attract interest to the garden in early spring and rarely, if ever, will need spraying. Visitors will walk toward an open area. This could be lawn in the beginning but eventually could hold a gazebo, sculpture or an outdoor classroom structure. Beds of flowers (shrub roses, perennials and annuals) coax the visitor into the orchard. Grape trellises appear on either side. An area is dedicated to miscellaneous small fruits (haskaps, dwarf sour cherries, aronia, currants, gooseberries, other) to draw interest and use for demonstration purposes. Crabapples have ornamental value and will be placed near the orchard “gazebo.” Pears and apples will be our tallest trees and will serve as the background planting. Many foundations, businesses and community organizations sponsor local projects. The following is a sample of funding sources relevant to community gardens and orchards. These sources are listed as a convenience for readers. Inclusion in this list is not an endorsement by the NDSU Extension Service, nor is this list exhaustive. Who May Apply: This is a publication for anyone seeking help from federal programs to support innovative enterprises, including community gardens and orchards. The following form is intended as a guide only; be sure that the final agreement you use meets the needs and details of your group and the property owner. project, for the term of ____ years beginning _________ and ending _________. This agreement may be renewed with the approval of both the property owner and the community orchard organization at the end of the agreement period. All questions about the community orchard, including its nature, risks and hazards have been discussed with the orchard coordinator to my satisfaction. The community orchard agrees to indemnify and hold harmless the property owner from all damages and claims arising out of any act, omission or neglect by the community orchard, and from any and all actions or causes of action arising from the community orchard’s occupation or use of the property. As the property owner, I agree to notify the community orchard organization of any change in land ownership, development, or use 90 days prior to the change in status. Source: The American Community Gardening Assn. Sample BylawsThe following are the bylaws adopted by the Bloomington Community Orchard in 2010. These bylaws serve only as an example of how a community orchard organization may structure itself and is not necessarily an endorsement of this organization or its structure. Organizations in North Dakota may find it helpful to use these bylaws as a framework and then modify them accordingly. Amy Countryman’s proposal to the City of Bloomington served as the catalyst for a Community Orchard idea coming together with land, funds and volunteers. The City donated land near the Willie Streeter Community Garden, across from the YMCA, and $2000 to launch the project, but did not want to take on long-term maintenance or cost. Over one hundred community members attended an initial planning meeting. Many expressed the desire to live sustainably and develop community relationships. Out of a subset of these volunteers, came these governance ideas. The goal of the community orchard is to grow food-producing trees that the community feels safe to eat, whose fruit is available without cost and the City of Bloomington does not feel obligated to manage. While several in the Orchard Community have expressed support for many community orchard sites, the City’s support has been extended specifically for the Winslow Woods site and is being run under the auspices of the City of Bloomington’s Park and Recreation Urban Forester. Good governance and participation may provide support for further community orchard opportunities. The Community Orchard Governing Board is comprised of 9 elected members. Decisions about the orchard are made by this group with input from the Orchard Community. The board can create subcommittees. Any powers of the board can be delegated to a subcommittee. Any delegated powers can be revoked by the board. The Orchard Community is made up of volunteers that have contributed at least 2 hours to the orchard planning or maintenance or who have donated at least $50 in a calendar year. Volunteer hours are tracked on an honor system with any other community member verifying. Any member of the Orchard Community is eligible to become a board member. In-person voting will take place at a Community Orchard Annual Meeting. Electronic and mail votes will be allowed up until the Annual Meeting. Each member of the Orchard Community is allowed one vote. Children capable of making an informed and independent decision are eligible to vote. The candidates that receive the most votes are chosen to represent the orchard. The standard term for a board member is two years. Board members can be reelected. In the first election, the top 5 vote-receiving candidates will be assigned 2-year terms and the next 4 vote-receiving candidates will be assigned 1-year terms to avoid having all board seats come open at the same time. Meetings in which decisions about the Community Orchard are made should be published in advance to the Orchard Community and open to public attendance. This includes both board meetings and subcommittee meetings. Meetings may or may not allow for public comment. A quorum of 7 board members must be present for decisions to be made. Where technology allows for remote attendance, it is allowed. Decisions are approved if two-thirds of the board attendees vote in favor of the decision. Decisions can be made via email if board chooses to do so. There is no voting by proxy. Community input should be sought. Board meetings will be held every other week during the planning of the orchard, moving to monthly after first planting. If a board member misses two consecutive meetings without consent of the board, they are assumed to have voluntarily resigned and their board position becomes open for election. The newly elected person will serve the remainder of the vacated term. The Community Orchard may find that the governance rules need to change. Changes to governance will be made at Annual Meetings and voted on by Orchard Community with two-thirds approval. The Community Orchard Governing Board can create temporary changes in governance rules in the time between annual meetings to meet the needs of good governance. These changes will be brought to the Orchard Community at large for a vote at the next annual meeting. If the Orchard Community is unhappy with the actions of the Community Orchard Governing Board, they may, with signatures equal to 10 percent of the attendees of the last Annual Meeting, call for a referendum to either change board members or governing rules. The board should choose among its elected members at the first meeting after the Annual Meeting, someone to serve as the Facilitator, the Assistant Facilitator, the Secretary and the Treasurer. The Facilitator is responsible for creating an agenda, convening the meetings, and facilitating the meetings to ensure they run smoothly. The Assistant Facilitator is responsible for the duties of the Facilitator when the Facilitator is absent and serves as the liaison to any subcommittee that does not have an appointed board member appointed as its liaison. The Secretary is responsible for communication of the meeting times to the Orchard Community, for recording meeting minutes and the votes of any meeting, and performing any board correspondence needed. The Treasurer is responsible for paying for all items approved by the board and accounting for all monies spent. The board is responsible to make sure communication to the community and financial accounting take place. This group can choose to do it themselves or ask someone to take care of these responsibilities. Design of an orchard that is sufficiently diverse and capable of producing with the minimum amount of intervention requires careful planning. The board is encouraged to consult advisors that have knowledge in these areas. A Community Orchard Fund has been set up within the Bloomington Tree Fund. Donations for a Community Orchard at Winslow Woods can be made to this fund. Funds can be spent on anything that directly or indirectly supports the Community Orchard Goal. Expenditures should be approved by the board or its delegates. NDSU publications on managing fruit crops provide science-based, nonbiased information for orchards in our state. The Master Gardener program can be a valuable source of technical advice and volunteer labor. The Junior Master Gardener Program has resources to incorporate a youth education component into a community orchard. The NDSU Yard and Garden Report provides regular updates on emerging pests and other issues related to fruit and other horticultural crops. The latest report is available. Several NDSU regional Research Extension Centers conduct research on fruit crops and have demonstration plantings available for viewing. The center in Carrington has an extensive collection of fruits (especially small fruits), and the vineyard in Williston is well established. These and additional resources from North Dakota State University can be accessed through local county educators and regional horticulture educators. Local NDSU Extension offices are listed online and in the government section of local phone books. Go to for more information on the publications and programs offered by the university. The North Dakota Grape and Wine Association is an active supporter of fruit production in the state. It has an impressive network of growers who can provide technical assistance and conduct educational meetings on a regular basis. The Natural Resources Conservation Service offers assistance to community programs and individual growers who foster productive lands and healthy ecosystems. Sustainable Agriculture Research and Education (SARE) offers grants and outreach programs to farmers and educators to advance sustainable farming systems. Local city or county foresters are valuable resources. Employees at local garden centers and nurseries have knowledge on local gardening practices and pests. American Community Gardening Association. 2016. Ten steps to starting a community garden. Centers for Disease Control and Prevention. 2012. North Dakota State Nutrition, Physical Activity, and Obesity Profile. Division of Nutrition, Physical Activity and Obesity. Washington D.C.
Common Ground. 2011. Apple Day: Community orchards. Eames-Sheavly, M., M.Pritts, et al. 2010. Cornell guide to growing fruit at home. Cornell Cooperative Extension. Ithaca, NY. Gough, R.E. 2007. Juneberries for Montana gardens. Montana State University Extension. Bozeman, MT. Hoover, E. and M. Zins. 2011. Fruits for Minnesota. University of Minnesota Extension. St.Paul, MN. Roper, T.R. 2001. Rootstocks for fruit trees in Wisconsin. University of Wisconsin-Extension. Madison, WI. Roper, T.R. and G.G. Frank. 2004. Planning and establishing commercial apple orchards in Wisconsin. University of Wisconsin-Extension. Madison, WI. Roper, T.R., D.L. Mahr, and P.S. McManus. 2006. Growing apples in Wisconsin. University of Wisconsin-Extension. Madison, WI. Smith, B.R., D.L. Mahr, P.S. McManus, and T.R. Roper. 2007. Growing raspberries in Wisconsin. University of Wisconsin-Extension. Madison, WI. Smith, B.R. and T.R. Roper. 2005. 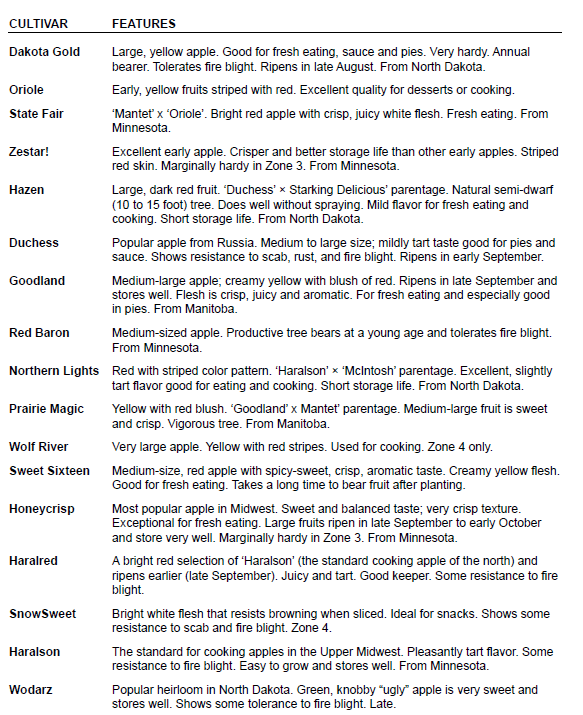 Home fruit cultivars for northern Wisconsin. University of Wisconsin-Extension. Madison, WI. U.S. Department of Agriculture. 2014. 2012 Census of Agriculture Report. North Dakota State and County Data. Washington D.C. The authors are grateful to Agriculture Commissioner Doug Goehring, Jamie Good of the North Dakota Department of Agriculture and the late Chuck Fleming, formerly with the North Dakota Department of Agriculture, as well as Chris Boerboom, Stevan Sagaser, Ron Smith and Todd Weinmann of the NDSU Extension Service and Harlene Hatterman-Valenti of the North Dakota Agricultural Experiment Station for their assistance in making this publication possible.